Gangsterism Out : Quebec HA searching for mole? Police assume one motive for two burglaries perpetrated September 5, in Montreal and Longueuil, at the homes of prosecutors. The criminals stole only investigation reports and court documents without touching valuables. 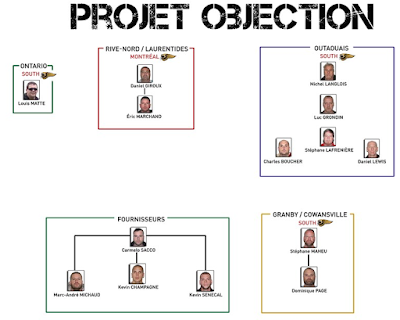 'Project Objection,' resulted in the arrest of 70 alleged traffickers, including four members of the Hells Angels in April. Sources say the bikers want to know who is testifying against them.